Ever struggle with cooking for a crowd due to the variety of food allergies and requirements that come with it? Risotto is a perfect go-to option thanks to its versatility, satisfying needs of gluten free, vegetarian and even vegan eaters. This delightful rice imitates pasta and makes a perfect background to carry vegetables or meat. In this version, carrots and fennel take center stage to give an interesting, warm fennel flavor with the slight sweetness of carrots. When cooked properly, risotto is creamy on its own, but I did dip into some Manchego cheese for a bit of extra salty creamy goodness. Not only does it taste good, but it develops a gorgeous golden color. There are keys to cooking risotto crucial to developing the creaminess, and they’re pretty easy to get down: toast the rice, preheat the liquid before adding and use a wooden spoon to help determine when to add more broth (more on that below). Take your time and let the risotto develop. It’s worth it. This dish is great on its own or pair it with roasted meat as a side dish for a Fat and Happy crowd-pleasing meal. Heat the broth in a separate pan and keep a low simmer. Warm the olive oil and add in the onions, fennel and carrots. Grind fresh black pepper in at this point to (about five turns worth). Sauté over medium-low heat until the vegetables are softening but still have structure to them. Could be almost 10 minutes. Remove about 1/2 cup of the carrot mixture and set aside. Add rice to the pan and sauté about 3 minutes to toast the rice. Stir often. Add in 3/4 cup of the heated broth and stir well. You want the rice to soak up all the liquid before adding in more. To determine if it’s time to add in additional broth, scrape the bottom of the pan with the wooden spoon. Can you see the bottom of the pan or is it immediately covered with liquid? If the scraped section is relatively dry, add in one cup of broth. Continue until the rice is al dente. It’s important not to overcook the rice. Start testing the rice at about 16 minutes into the cooking process. You might not need all the broth or you might need a little more. Just depends, so test often. If you run out of broth, just continue with simmering water. 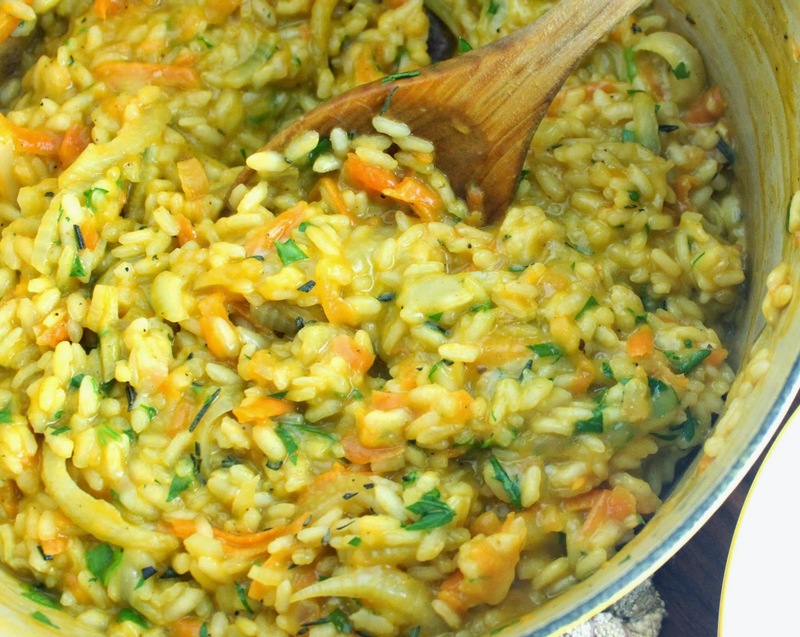 Remove the risotto from the heat, stir in the parsley, rosemary, cheese (if using) and carrot mixture that was set aside. Taste and adjust with salt and pepper. Serve immediately. Happy Healthy Tips: Carrots have the potential to reduce free radicals in your body thanks to the beta carotene and help our vision through vitamin A.